The Gorkha Janmukti Morcha (GJM) affiliated Darjeeling Terai Dooars Plantation Labour Union today threatened to call a day-long token general strike in the hills if the bonus meeting scheduled on September 17 fails to yield positive results. 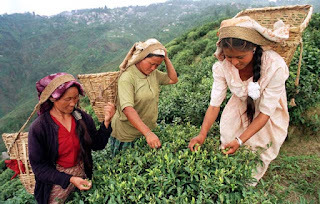 The GJM Trade Union wants workers to get the prescribed 20 per cent bonus irrespective of the category the tea gardens fall in. What has irritated the trade union is the failure of the management and the Darjeeling Tea Association to call early bonus meetings in spite of knowing the Puja festival starts early this year. The DTA and the garden managements have called the first of the bonus meetings on September 17. And it is expected there will be several rounds of talks before a final conclusion is arrived at. But the DTDPLU wants the bonus amount to be finalised on the very first meeting which will be held in Darjeeling. “Usually by September 17, we have two to three bonus meetings unlike this year. Given the early Puja period this time, we want the bonus to be finalised on the first meeting itself. And we will not accept anything less than 20 per cent,” said Prashant Pradhan, the assistant general secretary of the DTDPLU. After the GJM came to power and the DTDPLU was formed, the union had actively pursued the bonus issue with the management. In 2010, the management agreed to hike the bonus to 20 per cent for groups A, B and C while grade D workers got 17 per cent. However, from 2011 onwards, the DTDPLU managed to persuade the management to agree to a blanket 20 per cent raise for all grades of workers. “We will ensure the management gives 20 per cent as bonus to the workers irrespective of the grades they fall under. We will not accept any kind of excuses from the management and the DTA,” asserted Pradhan. The union threatened to call a token strike the date of which it said would be finalised later. However, gate meetings will be held across tea gardens from September 18. “If the September 17 meeting fails to yield positive results, we will start gate meetings from the next day onwards. We will also call a general strike to get our demand addressed,” warned the DTDPLU assistant general secretary. More than 55,000 workers are permanently engaged in 87 tea gardens covering 17,200 hectares of plantation land in the hills and they are either members of the DTA or the Indian Tea Association.